The process by which the brain detoxifies and cleans itself of the natural inflammatory processes, which during wakeful hours, through exposure to light, and the energy demands of the day cause damage to our cells. The rhythms of the body are entrained to the rhythm of the 24hr light/dark cycles by the pineal gland and suprachiasmatic nucleus (SCN). Reducing light stimulates the pineal gland to secrete serotonin into the blood stream and cerebrospinal fluid. Melatonin follows to induce sleep. The brain requires sulphurs to clear itself of debris and toxins. 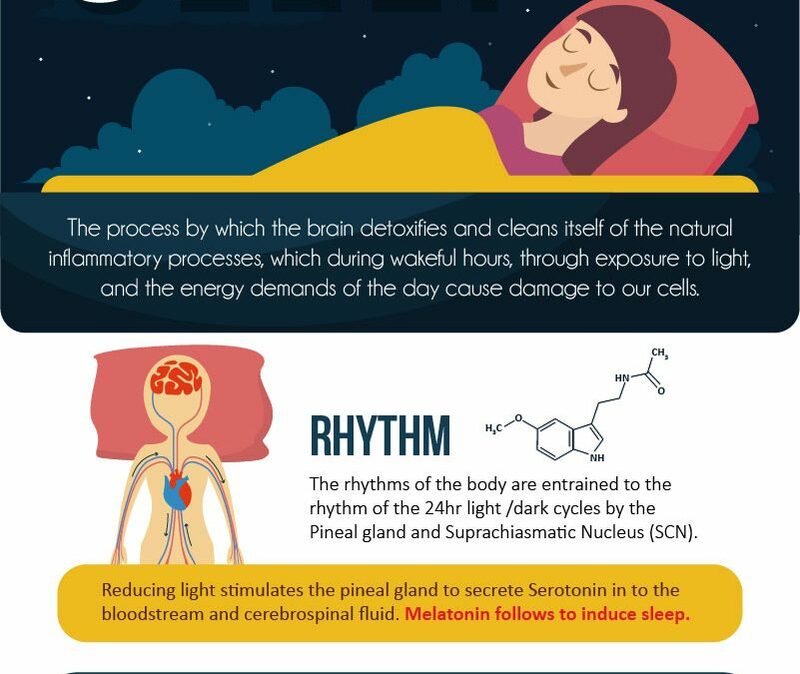 Melatonin should resupply the brain with adequate amounts of sulphate and is also integrally connected to glutathione up regulation, a primary antioxidant of the brain. UV light exposure to the pineal gland stimulates the release of heparan sulphate. Heparan sulphate is broken down by the dark cycle so that melatonin can be conjugated with sulphate and distributed throughout the brain during sleep. The ascending reticular activating system should fire to sustain wakefulness during the daytime through inhibition of the sleep switch – the ventrolateral pre-optic nucleus (VLPO). The VLPO, GABA and orexin fire to inhibit the ARAS to induce and maintain sleep. Continual exposure to back lit screens reduces melatonin production in the retina and stimulates the ARAS, telling your brain it’s day time all the time. Reduced exposure to natural light during the day time through the retinas and skin reduces the production of sulphates. The SCN and pineal gland are both light and magnetically sensitive. This magnetic sensitivity is specifically related to the Schumann resonance of the earth. Inappropriate light stimulus during day and night, as well as a lack of earthing contact between the skin and surface of the earth creates a desynchronisation between nature and the brain. This increases inflammation and promotes disease.